Comfortable 1 Bedroom Vacation Rental - Just steps from the tropical beach! This one bedroom ground floor fully furnished apartment is situated in the quiet end of St. Lawrence Gap within easy reach of beaches, restaurants and entertainment. 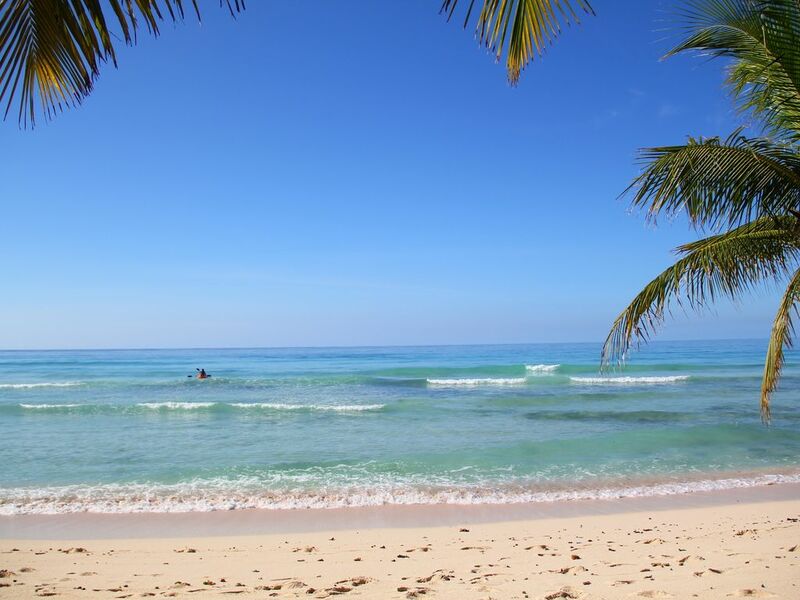 Just steps away is a lovely tropical beach ideal for swimming, water sports, strolling, sunbathing and collecting sea shells. 2 minutes stroll away are two other exquisite beaches where water sports such as boogie boarding, hobie-cat cruises and jet skiing are available. There are convenient mini-marts nearby along with car rental companies, souvenir & gift shops and banking facilities. A wide variety of dining is easily accessible including local and Caribbean dishes, pizza, Chinese, Italian, Mexican, Thai and international cuisine. Options vary from budget friendly eateries to internationally recognized fine dining. Anglican, Roman Catholic and Moravian churches are close by. The living area is comfortably furnished with a comfortable sofa bed, satellite TV with US and UK channels, and telephone. If you are in the mood to cook... the kitchen is fully equipped with fridge, stove, microwave , toaster, blender and coffee maker as well as crockery and other kitchen essentials. A small dining table seats four. There is a double bed in the bedroom and an extra person can be accommodated on the sofa bed in the living room. The bedroom is air-conditioned. This apartment is suitable for 2 adults, but children under 15 yrs can be accepted and will stay free. Maid service is provided once a week. There is a separate laundry located onsite with a washing machine, iron and ironing board. In the yard surrounding the house are fruit trees and tropical flowering shrubs. The large patio is completely enclosed with wrought iron for your safety. Each window is protected by burglar bars. Smoke alarms and a fire extinguisher are provided. There is an emergency exit from the bedroom. For those who love the entertainment area of St Lawrence Gap this is a great place to stay as a short stroll takes you to the heart of “the Gap” with its exciting nightclubs! For an older couple the apartment is conveniently located on ground level and is within easy walking distance of beaches. For families, children can play safely in the enclosed patio while parents relax. A small play park is located a few minutes walk away. Whatever the reason for your visit, this comfortable apartment is sure to please. 1. A non-refundable deposit of US$150 is required to secure your reservation. 2. Payment by cash, travellers cheque or bank draft. You'll be staying in the lively St.Lawrence Gap area with its exciting nightlife and excellent dining. You'll be close to the action but still enjoy the tranquility of being at the quiet end of the Gap. An amazing tropical beach with crystal clear turquoise waters in just steps away. Rates are lower than traditional hotel rooms plus our vacation rental offers additional space in which to truly relax. Enjoy the privacy of staying in your own personal accommodation rather than a simple hotel room. En-suite to bedroom. Standing shower. Steps from the turquoise sea. A lovely tropical beach is just steps from the property. This ocean is just steps from the property. The bedroom is air conditioned. There is a standing fan in the living room. Bath, kitchen and beach towels. Bedsheets, pillows and pillow cases. Large living area with cable TV, sofa bed, chairs, and coffee table. Gas stove with 4 burners, oven and broiler. Paper towels and dishwashing liquid are provided. Fully equipped with dishes, utensils, saucepans, etc. Fully equipped kitchen including fridge, stove, sink, microwave, toaster, blender and coffee maker. Small dining area with table and 4 chairs. Satellite television (DirecTV) with US and UK channels including popular networks, news stations, music stations and children's programming. Beach toys can be provided for children. Small lawn. Lots of tropical flowers and fruit trees in the garden. Fully enclosed patio with lounge chairs. We absolutely enjoyed our stay in Barbados. The owners were very friendly and welcoming and checked up on us to make sure that we were ok and had all that we needed. The first thing that stands out about this vacation home is that it's surrounded by a beautiful garden! There is a parking space for a car if you choose to rent a vehicle. The interior is very clean, comfortable and cozy. We loved that it's self contained and we could make our own meals if so desired. Having the laundry facilities at our disposal was great! Location, location, location; within walking distance to the beach, grocery, bars, restaurants and one of the south coast's favourite spots....St. Lawrence Gap! I highly recommend this vacation spot to anyone who's looking for a totally relaxed time in Barbados. I arrived in Barbados April 16, 2013 and it was wonderful. The first thing that stands out about the property is the house is pink! I thought that was so cute. Furthermore, the owner has a mango and a lime tree in the yard, talk about nature. The owner, was very pleasant and welcoming. I really enjoyed how close the beach was to the property; literally less than 20 sec. You can actually hear the sea, that's how close the property is to the beach. The house is very clean and cozy, and I felt safe. Across the from the property is a grocery store, bar, and much more. I look forward to going back again this year for my birthday! fingers cross. I've stayed at this location a number of times over the past couple of years. It truly is a hidden gem!The owners are really sweet and always available if you have any questions. The location is excellent and it really is a stone's throw to the beach. You are on the quiet end of St. Lawrence Gap,but walking distance to shops,clubs,& eateries. I'm looking forward to my next visit! Our fully furnished apartment is situated in the quiet end of St. Lawrence Gap, Barbados within easy reach of beaches, restaurants and entertainment. Just steps away is a lovely beach ideal for swimming, strolling, sunbathing and collecting sea shells. Within 2 minutes walking distance are two other exquisite beaches where water sports such as boogie boarding, hobie-cat cruises and jet skiing are available. There are convenient mini-marts nearby along with car rental companies, souvenir and gift shops, banking facilities, etc. The lively end of St. Lawrence gap, with nightclubs and bars, is just 3 minutes stroll away. 10% Government Tax (Shared Economy Levy) on the accommodation cost (excluding any VRBO Service Fee) will be charged at the time of departure. Rates are subject to change until reservation is confirmed.